The voice on the other end of the line croaked: "Matt, this is bigger than Belize!" I’ve come to recognize John McAfee’s gravelly voice – which tonight sounds like he’s swallowed a rock garden. He tells me ebulliently, he's on a boat, he’s running for President and he’s running from the IRS. An $8 million dollar yacht, he boasts. Well, not a new yacht, and not exactly his, but a supporter's yacht, but it’s beautiful. Today, McAfee posted new video of his boat being boarded by what appears to be Bahamian officials inspecting the arsenal he’s brought with him. Seven years ago, John McAfee -- the man who created McAfee anti-virus software in the 1980s and made millions of dollars when he sold his security software firm McAfee Associates -- was on the run from police in Belize. The Belize authorities launched a nation-wide manhunt because they wanted to talk to him about the murder of his American neighbor, Gregory Faull, who died after being tasered and shot in the head. 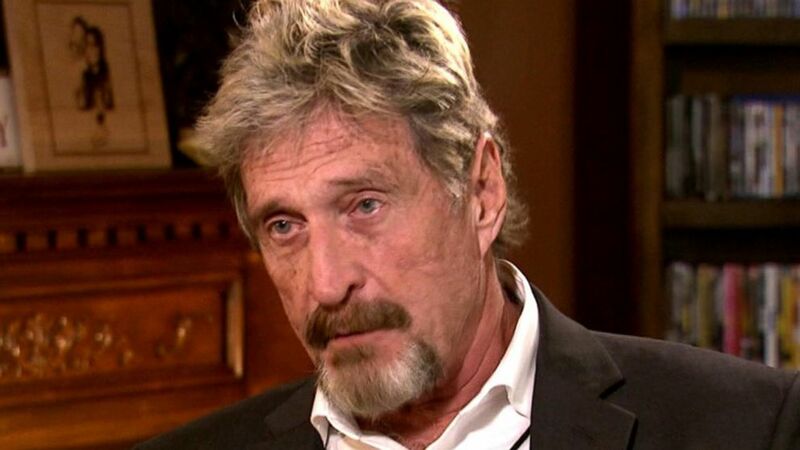 McAfee fled to Guatemala and was apprehended there. Dozens of reporters surrounded the immigration detention center he was sent to, and when he collapsed with a heart attack, we followed an ambulance all the way to a hospital. Dozens of reporters followed the gurney into the emergency room, crowding around the ashen-faced McAfee. At one point McAfee opened one eye, spied the journalist nearest his right hand (which happened to be me) and handed me his cell phone, before resuming the masquerade of his heart condition. We handed the phone off to his lawyer immediately thereafter. But it was an introduction to this elusive man, a computer engineer who also loves being a showman. McAfee, who claimed he was innocent of that murder and was never charged in connection with the murder, eventually was deported to the U.S.
Back to that boat. On the phone and in subsequent tweeted videos, McAfee admits that he hasn't filed taxes in eight years, despite becoming what he boasts as "the biggest owner of crypto-currency in the world." He is indeed feted all over the world by crypto-types, snaps pics with Winklevoss twins and posts boozy pistol-waving rants for his million-plus social media loyalists. He insists he's not guilty of fraud, because he's never filed anything, thus never lied. Libertarians, like himself, believe income taxes are immoral. So he's taking a stand even as he says a grand jury is being convened to indict him. Since he won't be returning to the U.S. for a while, he intends to campaign by giving his volunteers several thousand pictures of his face and several thousand little speakers that attach to phones to blast out his voice as they go door to door. He won't win -- at least, he hopes not. But McAfee stands to at least make an already interesting election cycle even livelier. This report was featured in the Thursday, Jan. 24, 2019, episode of ABC News’ daily news podcast, "Start Here." "Start Here" is the flagship daily news podcast from ABC News -- a straightforward look at the day's top stories in 20 minutes. Listen for free every weekday on Apple Podcasts, Google Podcasts, iHeartRadio, Spotify, Stitcher, TuneIn, or the ABC News app. On Amazon Echo, ask Alexa to "Play 'Start Here'" or add the "Start Here" skill to your Flash Briefing. Follow @StartHereABC on Twitter, Facebook and Instagram for exclusive content, show updates and more.